Here is a round up of book related favourites for the month of December, 2015. 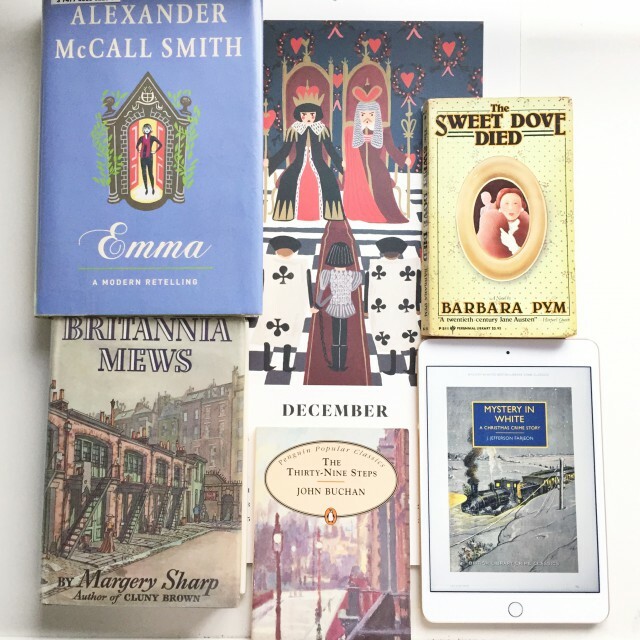 For a glimpse into November, 2015’s Bookish Favourites please see here. I read a total of five books in December. 1) The Sweet Dove Died (4/5*) by Barbara Pym. #currentlyreading 'The Sweet Love Died' by the inimitable Barbara Pym. (By the way, could we have a vote for the ugliest book cover ever? !😀) ——————————————– 'How do you think of me, then?' Leonora asked. 'Just living in your perfect house, leading a gracious and elegant life,' said Meg. 'It's hard to explain,' she said, seeing a shadow of displeasure cross Leonora's face. 'You make me sound hardly human, like a kind of fossil,' Leonora protested. ———————————- Leonora Eyre, a middle-aged woman of independent means, finds herself confronted with the unusual predicament of becoming romantically entangled with a uncle and nephew pair. Both the uncle and nephew vie for her attention and when she chooses to bestow her affection on the young nephew, she is confronted with the unhappy truth that she may not be in a position to have a future with him. 2) The Thirty Nine Steps (4.5/5*) by John Buchan. It's been a misty or as they might say 'hoary' kind of day (isn't 'hoar' the most magnificent word?) here in Massachusetts. It's the kind of weather that reminds me of Scotland and what better book to take you to Scotland than John Buchan's classic thriller 'The Thirty Nine Steps'? This is one of the several books I'm #currentlyreading and it is very atmospheric. I am tempted to watch Alfred Hitchcock's epic dramatization of the novel again. Have you seen it? I love it! 3) Emma- A Modern Retelling (3.5/5*) by Alexander McCall Smith. I seem to be posting a lot about Austen's Emma recently. I'm finishing up Alexander McCall Smith's 'Emma- a Modern Retelling'. I actually started this book in the middle of the year! McCall Smith is one of my favourite contemporary authors. I rush to read the new books in the Isabel Dalhousie series or the Scotland Street Series. In this book he puts a contemporary twist on Emma Woodhouse's story. She drives a mini, responds to e-mail and has even done a decorative arts course at Bath University. She has not lost her meddling ways though and her father in this novel is an anxious hypochondriac. Light and playful, this book made me laugh many times whilst reading it. 4) Mystery in White (4/5*) by J. Jefferson Farjeon . The gloaming hour is upon us. Time to light up those golden candles, forsake the 'to do list', sip the warming honey green tea and slip into that delicious mystery novel that is set on the eve of Christmas. Several passengers are stuck on a train that gets trapped in the snow on Christmas Eve. Some passengers, rather foolishly, decide to venture out into the blizzard enveloping the immediate countryside. They stumble upon an empty country house and decide to seek shelter there. The fire is lit, the tea table set and the kettle is on the boil. But the owner of the house is nowhere to be seen. Trapped in the house due to the deep, all encompassing snow, there is an eerie sense of impending doom surrounding the house and it's inhabitants. What will happen next? ——————————————– 'Mystery in White' by J Jefferson Farjeon is a terrific, atmospheric read. Reading this as a buddy read with my dear friend @louised_1987 and so far, I think we both agree it is a terrific book! 5) Britannia Mews by Margery Sharp. #Currentlyreading what may be my last book of 2015. 'Britannia Mews' by Margery Sharp. Set in the late nineteenth century, Victorian London is portrayed at the intersection of where the rich meet the poor. A rich girl, Adelaide Culver, marries into the slums of the Britannia Mews that have for the longest time bordered her family's stately house on Albion Place. This is the story of what happens to a girl who has bravely broken away from the family shelter into a life of domestic strife and hardship. Enjoying Margery Sharp's excellent writing, descriptive and laced with subtle wit and wisdom. I published nine blogposts excluding this round-up post this month. Two were reviews of children’s books: The Story of Babar and Miss Rumphius. The rest included reviews of the books- Family Roundabout and Illyrian Spring. I also published bookish list posts: 12 New Authors I Would Like to Read in 2016, Top 10 books of 2015, 12 Classics I Want to Read in 2016, 5 Endearing Christmastime Scenes from the Best Children’s Books and 2015: A Diary of Reading in 30 Instagram Pictures. I wrote a blogpost for Mustlovefestivals.com interviewing the Latvian Tourism Board regarding the best upcoming Latvian Festivals in 2016. It was lovely chatting to Lelde Benke and learning about the Staro Riga Festival of Lights and the Cesis Town Fair. The whole family sat down to watch ‘Home Alone‘ and the recent Disney adaptation of ‘Cinderella‘ during Christmas time. We adults watched ‘Brief Encounter‘ directed by David Lean. I highly recommend this movie, adapted from a minor play by Noel Coward. After reading Buchan’s ‘Thirty-nine Steps‘ we also watched the Hitchcock film by the same name. The story has been slightly modified for the big screen but both the book and film are exceptional. I listened to the excellent BBC dramatization of Dodie Smith’s ‘Dear Octopus’ on BBC radio this month. I also listened to the BBC dramatization of a ‘Brief Encounter‘. I purchased a number of Noel Coward plays on audible this month. I did a few paintings for my art journal on Instagram. It is my favourite social media platform! "Marley was dead, to begin with… This must be distinctly understood, or nothing wonderful can come of the story I am going to relate." ——————————————– Thus began Charles Dicken's classic tale that conjures up one of the most enduring messages of Christmas that a writer has penned, in our collective literary history. Day 11 of @catebutler and @bookloversnest 's #holidaybookchallenge . A Christmas Carol. Wish you all a very happy, peaceful and prosperous New Year! Have you been reading/listening or watching anything nice this month? Emma looks absolutely great! I’ve been recently stuffing my shelves with McCall Smith’s books. This should be a great addition to it. Very light and enjoyable in McCall Smith’s humorous vein.